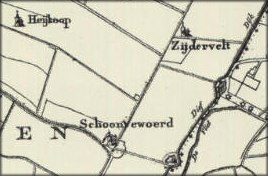 Zijderveld is a surname derived from a place name, a toponym. Zijderveld is a village located in the middle of The Netherlands in an area known as Vijfheerenlanden (literally “land with 5 lords”). Among the 5 lords that the area takes its name from are the medieval Lords of Arkel that are likely my ancestors, too. Zijderveld is a small village in the middle of The Netherlands. My maternal grandmother is Willempje Cornelia (“Willie”) Zijderveld (1892-1976). We descend form Joost Florens Zijderveld who was married to Hester van Dam on 20 June 1717 in Lexmond. Lexmond is another village in the Vijfheerenlanden area. Their grandson, another Joost Zijderveld (1759-1805) moved to Zwijndrecht, Holland, and married twice. His son Willem Zijderveld (1794-1859) moved to nearby Hendrik-Ido-Ambacht. Willem's grandson Cornelis Zijderveld (1858-1928) moved to the nearby city of Dordrecht. There his only daughter, my grandmother, was born. Joost Florens Zijderveld is likely (but not proven) the grandson of a Joost Floren who lived in Lexmond in the 17th century. One of his sons, Floor Joosten, baptized on 25 April 1652 in Lexmond, is likely the father of my ancestor Joost Florens Zijderveld. Another son, Cornelis Joosten, baptized on 23 January 1659 in Lexmond, is the ancestor of a Zijderveld family that remained in the Vijfheerenlanden.